Astronomy Astrophysics is publishing the results of a detailed investigation of how many ‘ultra-compact dwarf galaxies’ (UCDs) can be found in nearby galaxy clusters. UCDs were recognized as a populous and potentially distinct class of stellar systems about a decade ago. But they are still mysterious objects that are characterized by a compact morphology (30-300 light-years in size) and high masses (more than one million solar masses). More generally, their properties (e.g., their size, shape, or luminosity) are similar to those of both star clusters and dwarf galaxies. Several hundred UCDs have been found to date. Two main formation channels for these puzzling objects have been proposed so far. UCDs might either be very massive star clusters or be ‘normal’ dwarf galaxies transformed by tidal effects. S. Mieske, M. Hilker, and I. Misgeld (ESO) present a statistical study of the UCD population: they define new statistical tools that relate the number of UCDs to the total luminosity of their host environment. This allows them to use statistical arguments to test the hypothesis that UCDs are bright star clusters. They predict that if UCDs are bright star clusters, we would expect to find only one or two UCDs around the Milky Way, which corresponds to what is seen, as omega Centauri is the only Milky Way satellite that can be considered a UCD. With their new tools at hand, the authors have investigated the results of spectroscopic UCD surveys in the environment of massive galaxy clusters such as Fornax, Hydra, and Centaurus, as well as in galaxy groups like our very own Local Group. Most data analysed were obtained at ESO’s Very Large Telescope in Chile, using the instruments FLAMES, VIMOS, and FORS2. 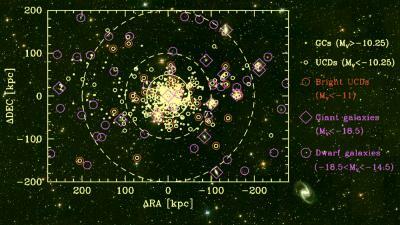 For the Fornax cluster, they also used a large database of compact stellar objects, which contained about 180 UCDs. This statistical study clearly shows that the luminosity distribution of UCDs match very well that of the brightest globular star clusters. It supports the hypothesis that the vast majority of UCDs are actually very massive star clusters. From a statistical point of view, there is no need to invoke another scenario to explain the origin of UCDs.